I've always wondered about this oil. 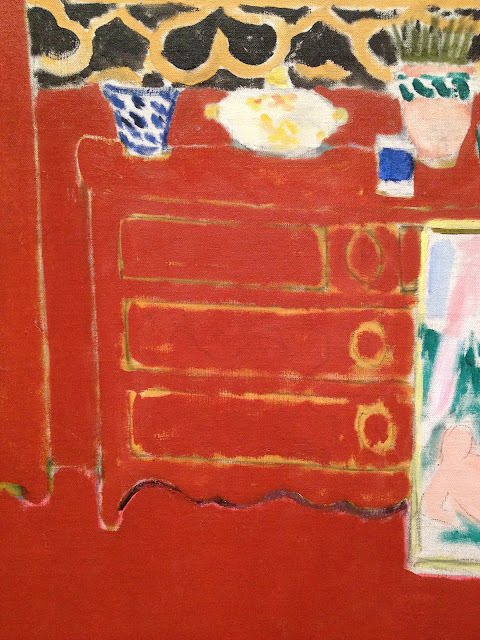 Did Matisse begin a painting with all of these objects painted normally in the room in only to find that he didn't like where the oil was going? I recall an oil by Wolf Kahn of his barn in Vermont. It wasn't working out to his liking, so he add a white variant over the entire painting. It was a remarkable effect, rendering the entire painting in luminous shades of white - leaving the edges of the objects in relief. Wolf made a bold move in order to 'save' or bring more life into a troubled painting. The result was over the top. So when I went to NY last month, I was glad to see this painting again in person. 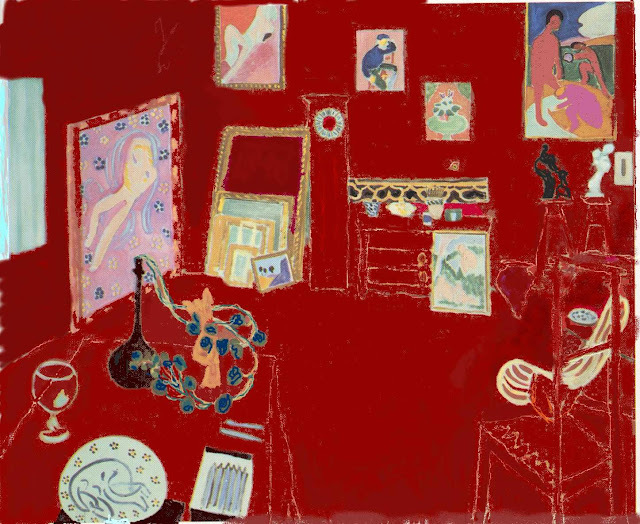 It is possible that Matisse sketched this in (tables, chairs) and began to fully paint in a few of the objects (vase, plate, some framed works) before reversing ground and insisting on the overall red effect? Did he plan the red oil the way we see it all along? It is possible that Matisse got into a fix and scrambled for a better solution? For this chest, Matisse outlined the object with yellow and green, with some pencil lines or grey paint. In other places, there is pink oil and white canvas. Did he begin to fully paint the chest or just outline it? Was he blocking in the objects normally or is this evidence that he was planning to cover it in red from the start? Interesting that you can see sketch lines but there is also work using the yellow again and traces of blue and purple. The yellow appears to be more that just an outline since it's visible under the red. This yellow intrigues me. Was he blocking in some of the objects in yellow and starting to add the blues and purples as well? Was he beginning to fill in the furniture in a normal way using a few colors? 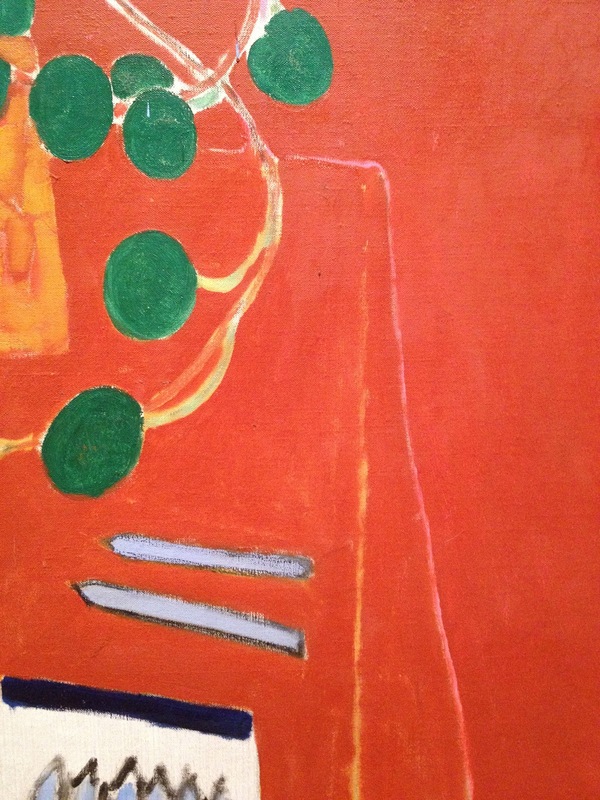 Who knows for sure what he was thinking and where the red comes in, but Matisse got to a point early in this work using a few spare colors and lines to get the painting blocked in without the red. 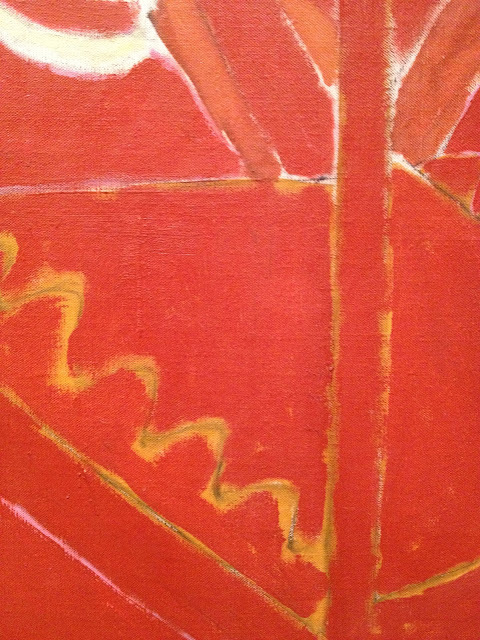 In this last close up, paint is added in places after the application of the red. 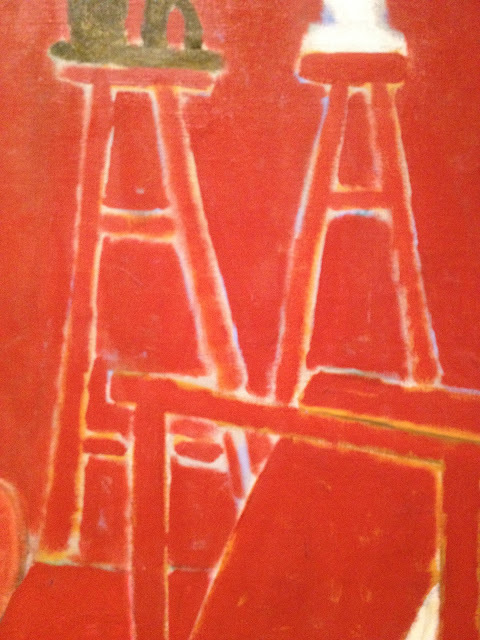 Matisse is now working on top of the red, bringing the oil to completion. Looking at these close ups, I'd offer that once he got a fresh look at this large oil in the early stages (due to an interruption by an incoming email, no doubt) he began to analyse his options and decided for something more powerful than another interior scene. Perhaps this composition was weak - lacking and needed more. Or it may be that the painting in progress was just fine, but once he got the idea of the red as an overall concept, the power of it would be too compelling to resist. Matisse doesn't give any clues. He said, "Where I got the color red - to be sure, I just don't know." Nor do we. At any rate, here is a powerful tool and strategy for making more engaging works. You can make bold moves to the point of possibly ruining your work, but the rewards are great if you handle the power of your Big Move.